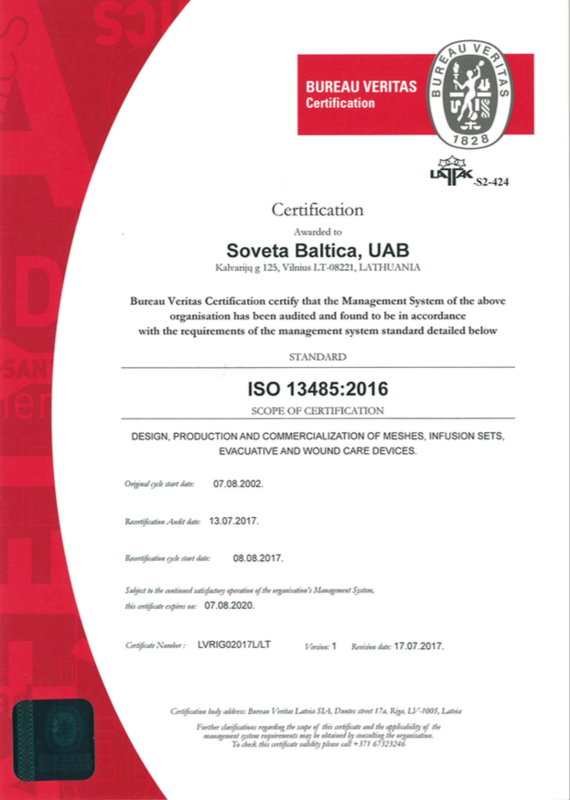 Since establishment of the "Soveta Baltica UAB&", a great deal of attention has been devoted to the development of a quality management system, and in 1998 was finalized in accordance with GMP (Good Manufacturing Practice) principles. In 2002, the Company&'s quality management system was certified in accordance with ISO 9001 and 13485 standards. The Company&,s quality management system is constantly maintained and improved to ensure its performance and effectiveness. All products of "Soveta Baltica UAB" meet the requirements of European Council Directive 93/42/EEC and Lithuanian Medical Standard MN 4, and have CE certificates of conformity.